Who will receive the bonus payment for clearing David Brown off the benefit books? Will it be the staff member who he claimed “belittled” him, shortly before he took his own life? Instead of taking a bonus, she should be facing a judge on a charge of corporate manslaughter. A football fan who desperately wanted a job took his own life after being ‘belittled’ by Job Centre staff, his inquest heard. David Brown, 18, seeking a welder’s apprenticeship, was under ‘immense pressure’ from the Department of Work and Pensions (DWP), the coroner was told. 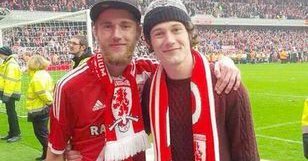 The Middlesbrough supporter, from Eston, North Yorkshire, was allegedly told he would have his benefits stopped unless he did more to find employment, reports Gazette Live. this is so sad reading this and it also makes me angry, just who do these dwp staff really think they are apart from thinking there god and being above the law as well as being patronising and almost to the point of thinking there actually smart, no doubt they be trying to find other ways of covering up this as a suicide caused by other reasons and not there fault, my thoughts are with the family and i hope they take action that leads to imprisonment of those responsible and a huge case for causing death by negligence that led to suicide, no doubt they are all feeling extremely proud of themselves and again shows the contempt that has to be had for the dwp in certain areas, granted there are some good staff, match them up against the ones that you turn to for advice who then try to mislead you and hey are a lost cause and should be held accountable for there decisions even if it means jailing them! like you said Mike she should be facing a charge of corporate manslaughter,and the hundreds with her respnslble for similar outrages,along with Cameron,May,IDS,Grayling,Hunt and the rest under whose watch these things are happening. This case was raised at todays PMQs, May’s stand-in looked very rattled. The DWP/Tories will just say ‘it’s a tragedy, but it can’t be proven’ and the coroner will collude…and nothing will change. Sadly I believe it is highly likely that the person responsible will get a bonus for this reprehensible behaviour. Former employment minister Esther McVey blamed front-line Jobcentre staff for unfair benefit sanctioning practices instead of taking responsibility for the culture that she had created. The current DWP ministers have the authority to crack down on this type of malfeasance, but have chosen not to do so because it’s being committed at their behest. It is conceivable that Penny Mordaunt, Minister of State for Disabled People, Health and Work, is urgently working on a package of measures to mitigate next April’s £30-a-week reduction in payments to new claimants of employment and support allowance (ESA) who have been placed in the work-related activity group (WRAG), because of my explicit threat to the DWP, made two months ago: If these life-threatening cuts are not rescinded, I wrote, I will ask the UN’s human rights chief to hold Work and Pensions secretary, Damian Green, accountable for ESA WRAG suicides and starvation deaths. The DWP could be held liable for ESA WRAG deaths because it refused to conduct a proper impact assessment demanded by both the House of Lords and the Equality and Human Rights Commission; see http://www.independent.co.uk/news/uk/politics/tories-block-plan-to-look-at-the-impact-of-their-disability-benefit-cuts-a6909036.html and http://www.theguardian.com/politics/2016/mar/01/equalities-watchdog-criticises-planned-cuts-to-work-support-allowance. But rather than rescind these pernicious cuts outright, which would be an embarrassing climbdown for her department, Penny Mordaunt is striving to come up with a package of measures to effectively reduce “non-work-related costs”, such as energy, broadband and phone bills. I intend to evaluate the DWP’s forthcoming package of measures to determine if they sufficiently address the subsistence needs of next year’s ESA WRAG claimants, many of whom have serious disabilities and illnesses. Charities report that 45% of people who put in a claim for Employment Support Allowance (ESA), and had Parkinson’s, Cystic Fibrosis, Multiple Sclerosis, or Rheumatoid Arthritis, were placed in the ESA WRAG. Will this package of measures consist of Discretionary WRAG Payments? I wonder. I fully expect some concessions from her department to mitigate the ‘human costs’ of these cuts.